Everyone was very friendly and didn't act like I was bothering them like some other realty companies that I had dealt with in the past. I received a courtesy phone call to make sure that I had arrived ok which I appreciated. AMAZING! The one word that sums up this trip. We mined for gems, ate at local restaurants rode the Polar Express with our 2 girls. Family puts the the spirit of Christmas into perspective. Thanks for the memories, we will treasure them forever. 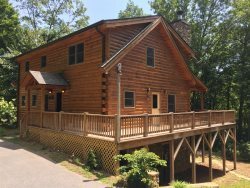 Carla and I came to this beautiful cabin and fell in love with The Smokies! Can't wait to come back. Family or friends this place makes it all worth it. My partner and I came up from FL to spend a few days enjoying cooler weather and the colors of the season. We were not disappointed!. We spent time in Asheville, hiking and riding the parkway. After our adventurous days the cabins was the perfect place to relax. We made this our first stop on our honeymoon hoping to see the mountains in the fall colors. We did the train ride the first day and the mountaintop zipline. Both were excellent trips. Everything was perfect. It was the perfect way to start our life together. We stayed at this cabin as part of our honeymoon. We loved everything about it. The views and the hot tub were probably our favorite features. WE hiked the "three waterfalls hike". Now we are off to our next adventure. This was a wonderful "retreat" before school/work life really kicks in. The weather was beautiful and we enjoyed the outdoors everyday. Enjoyed family time and this tucked away cabin was just right for us all. This cabin was very clean and accommodating. Everyone was very polite and helpful the few times it was necessary to call. We had such an enjoyable time here at the cabin. Bryson City is dull of friendly people and we loved the Cork and Bean. The cabins location is perfect. Close to all activities. Thanks again.